German performance vehicle manufacturer Brabus has done it again with the “world’s most powerful high-performance sedan”. Brabus has a history of churning out high performance sedans, but the new Brabus E V12 'one of ten' unveiled at IAA 2009 outdoes all previous efforts. Dubbed the 'Black Baron', the car features a newly-developed SV12 R Biturbo 800 12-cylinder displacement engine boasting a rated power output of 800hp (788bhp), which is able to propel the car to a ridiculous top speed of more than 370kmh (230mph). Looking like the perfect daily drive for Bruce Wayne with its matte black finish and menacing lines, the Black Baron is based on the new 2010 Mercedes E-Class W 212. Style modifications include a revised front bumper, new front quarter panels, side sills, and Citroen-like rear wheel covers that are there to aid the aerodynamics of the car, but don’t really gel with the rest of the vehicle's image. Completing the looks are a trunk-mounted spoiler and a carbon fiber rear diffuser integrated into the rear apron. The carbon fiber body kit was developed using a wind tunnel and adds just 36mm (1.4 inches) to the width of the E-Class while minimizing the aerodynamic lift of the front and rear axle. The SV12 R Biturbo 800 engine was specifically designed for this vehicle and has an increase from the standard 5.5 to 6.3 liters (336 to 384 cu. in.) over the 12-cylinder engine that usually powers the latest Mercedes 600 models. The increase is affected with a special crankshaft with longer stroke, precision-balanced pistons rods and pistons with a larger diameter and an increased cylinder bore. The inner workings of the Brabus engine are further modified with special sport camshafts and cylinder heads optimized for mixture flow. These modifications enable the engine of the Black Baron to produce a power output of 800hp (788bhp) / 588kW at 5,500rpm and peak torque of 1,420Nm (1,047lb-ft), available at a low 2,100rpm, although in the car peak torque is limited electronically to 1,100Nm (811lb-ft). The sedan, which weighs 1,980kg (4,365lbs), sprints from rest to 100kmh (62mph) in just 3.7 seconds. After just 9.9 seconds the four-door car reaches a speed of 200kmh (124mph), while the 300kmh (186mph) mark is achieved after just 23.9 seconds. Top speed is more than 370kmh (230mph) but is limited electronically for “reasons of tire safety” to 350kmh (217mph). Going so fast puts extreme demands on the brakes so the high-performance sedan is equipped with 12-piston aluminum fixed calipers and vented and grooved steel brake discs measuring 380 x 37mm (15.0 x 1.5 inches) on the front axle. The rear axle stops on six-piston aluminum fixed calipers gripping discs measuring 360 x 28mm (14.2 x 1.1 inches). The Brabus high-performance brake system also incorporates all functions of the standard Brake Assist system of the Mercedes E-Class. Meanwhile, the height-adjustable coil-over suspension was also custom-developed for the E V12. The ride height of the suspension can be adjusted to the owner’s individual preferences and compression and rebound rates of the front and rear dampers can be adjusted in ten steps between very comfortable and extremely firm for use on the racetrack. Sport sway bars reduce body roll in fast corners. Inside, the contoured custom front seats and the two rear individual seats are covered with a combination of Alcantara and black leather, smooth or perforated, as are the dashboard, door trim and headliner. The entire vehicle floor is covered with square-patterned leather and the ensemble is completed with matte-black carbon-fiber components for dashboard, center console and door panels. The Black Baron not only boasts the looks to suit Bruce Wayne, but also the price tag. 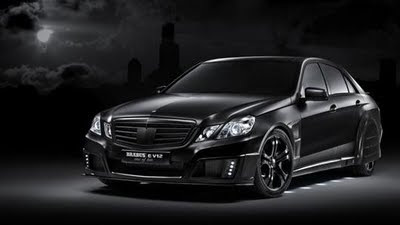 Only ten of the Brabus E V12 sedans of the “one of ten” edition will be built and sell for USD$875,000.